Good for runners who get tired after a hard race, sprinters will develop speed and lightness in the legs. Place thumb and index finger at the wall and spread the other fingers, step your feet back, press your hands into the wall and floor crease to bring your buttocks towards the ceiling. Step your feet towards your hands and come up. Press the index and thumb into the wall and roll the triceps together. As you continue that action bring the shoulder blades together and move the torso towards the crown of the buttocks. Relax the head. Lift the kneecaps and press the top center thigh back so much that the heels come to the floor. Now lift the inner heel to the inner knee and groin to the crown of the buttocks, as youlengthen theout knee ligament and roll the groins from the inside out. 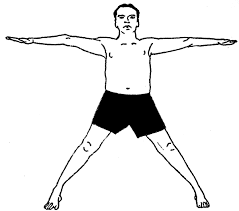 Contineu to press into the hands and move the torso towards the crown of the buttocks as you press into the heel and lift the inner leg up to the crown of the buttocks. There are so many important points in poses that must be learned for a pose to be done correctly. 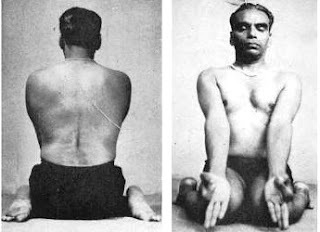 But once a person is aligned in a pose and can focus on the actions of the asana, there is one that has brought more strength and has improved my practice that I have found carries to a large portion of other asanas in the first years learning yoga. The top center thigh. The meatiest, centeriest, part of your thigh- typically right where your middle finger hits. When you learn to press that part of your thigh back to the bone you gain power in your legs that carries into other poses. Press into the big toe mound and the outer side of the feet, lifting the arches and inner legs. Lift the knee caps and press the top center thighs back as you lengthen the sacrum towards the hamstrings. Extend the torso towards the ceilings and bring the bottom shoulder blades together expanding the chest. Expand the arms from the center of the chest outward and look forward.